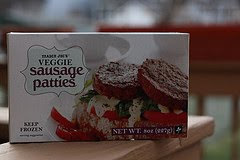 So a few posts ago I shared a little about giving up meat for Lent, and Trader Joe's has already really pleasantly surprised me with their soy meat products, so when they had their Veggie Sausage Patties at the sample station a week or so ago, it made for a natural pick up. It also led Sandy to think a little, like "Okay, we like Trader Joe's goods overall, but how do they compare against rival brands?" So this post, I'm going to do something a little different than the usual. Ladies and gentlemen, today you are about to witness history, the first head-to-head heavyweight championship of frozen vegetable sausage patties. The Soysage Showdown. One brand, known throughout the land, the undisputed champion. The challenger, an underdog, with a devoted following, its quality known to its devotees. Only one can prevail. Are ... you ... ready? LLLLLLLLLLLLet's get ready to crrrrrrrrrrrrrrumble!! Winner, and new world champion, by judges' decision .... Trader Joe's!!! You should try the chicknless nuggets! (TJs brand, of course). I just picked up a box, tempted by the buffalo chickn MorningStar ones, but went with the breaded TJs ones. I have yet to try them but I am excited. Hey Pj - certainly nice they have the option at least, isn't it? Be careful about purchasing meats there...I've had several occasions on which I had to throw out chicken, turkey and steak that smelled off upon opening the packages..I just purchased a stuffed turkey breast that was marked sell by 11/13 (purchased 11/04) and stuck in the back of my fridge where it's coldest immediately and upon opening it on Monday it smelled like feet. I spent $18.00 on this just to wind up in the garbage. This has happened time and time again. It's a problem. I've also had problems finding bugs in many of the cereals purchased there...normally I love trader joes and they have alot of great stuff there but I will NEVER purchase any raw meats or cereals from any of their stores again..ever! After reading reviews about these sausage patties, I went to Trader Joe's yesterday and bought a box. I was skeptical because I have not found too many veggie type foods that I really like. So after work off to trader Joe's with my daughter for a box of these sausages. Of course it is almost impossible to go into TJ and buy one item, so I bought TJ crescent rolls, honey, non-nitrate bacon, frozen brown rice and a host of other items I needed to fill my pantry. My daughter prepared our breakfast dinner (breakfast food at dinner time). eggs veggie sausage, and crescent rolls. The sausage was delicious and I was very impressed with the taste. I wanted to buy 2 boxes, but they only had one left, so I am waiting for another shipment. In the mean time, I will try the bacon with eggs, rolls, and some orange marmalade. try the "Gimmee Lean" sausage meat. I make my own little patties and can make them thicker or thinner as I like. I fry them up in a little grapeseed oil and they are quite tasty. I even like it cooked and crumbled on a veggie pizza. The MF's have improved a lot lately. When I first tried them, they struck me as rather dry and only tried them again recently. I thought they were quite good. I haven't tried the links again. I actually like their "bacon." I've tried the "Light Life" version, which is tasty, as well. I'd be perfectly happy with either. My choices are not so much about being "veggie" which I am not, but, liking these foods, but not the grease involved. I also try to go "light" on eating meat, so that it is only the occasional meal. I can't wait to try the Trader Joe's, but wanted to point out that you may even want to try them again only cooked a little better. In my experience, if you overcook the meatless sausages (patties or links) or burgers, etc., what happens is that the outside dries out while the inside turns mushy. Since you said yours were slightly overdone on the outside and you experienced mushiness in both, this may be the reason. It's best to just get them nicely and evenly cooked for the best overall texture, which will be more "meaty" and less mushy. I usually do the oven method (the MF recommended method), and then, if I really want to get the whole sausage experience, will just sautee them briefly in a pan that's been preheated and has a small amount of oil to just brown/crisp them a bit (quickly) before they can dry out. those veggie sausage patties are awful. I ate one and threw the rest of the box away. I should have eaten the box instead. The only way these would have been good is to have deep fried them and then what is the point. Yuck! I second Jimmy James' comment. I think the box for the TJ patty might actually taste better than the actual patty. I choked down the 1st one and took a bite of the second and returned it back to the plate, grabbed the box from the freezer and circular filed the rest of them. I love sausage but I'm trying not to eat it anymore but need a good substitute and those "sausageless" sausages did not win me over so I will give these a try in the breakfast category. Russ - your review is hilarious - you may have missed your calling if you aren't already comedy. Cheers!